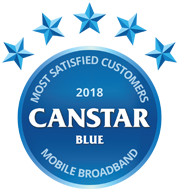 Canstar Blue’s annual review of mobile broadband providers compares providers Virgin Mobile, Amaysim, Optus, Vodafone, Dodo & Telstra based on value for money, customer service, network performance, bill clarity, contract clarity, ease of activation & overall satisfaction. Virgin Mobile has snatched the crown from Vodafone for overall mobile broadband satisfaction, rating five stars for performance, customer service and value for money. Gone are the days of dial-up and measly data allowances that cost an arm and a leg – nowadays even mobile broadband plans come with good amounts of data relatively cheaply. Mobile data is the ultimate for flexibility and browsing on the move, so get the lowdown on which providers offer the best bang for your buck with Canstar Blue’s 2018 mobile broadband review and ratings. This year we’ve surveyed more than 1,000 mobile broadband customers to offer some guidance. While everyone wants a bargain, it should be noted that the cheapest plans may not necessarily mean the best value. That’s something to keep in mind when we mention smaller service providers later. Our customer ratings have put Australia’s big three telcos to the test in Vodafone, Optus and Telstra, while also featuring some smaller providers in Virgin Mobile, Amaysim and Dodo. While Virgin Mobile topped the ratings, we should point out that the telco has since been closed down by its owner, Optus. Virgin Mobile dominated every category, with the only other five-star rating given to Vodafone for customer service. Vodafone had to settle for four stars overall, along with Amaysim and Optus. Dodo and Telstra both received just three stars for overall satisfaction. When shopping for a mobile broadband plan, you are presented with several options – do you go the SIM-only route or purchase it with a dongle or pocket Wi-Fi device. SIM-only plans can be great for your tablet or mobile device, while dongles can be plugged into laptops and pocket Wi-Fi can even be used to replace your home internet. 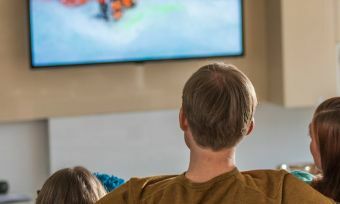 With 5G around the corner, it’s an exciting time to be a mobile broadband customer – so what are the best deals? Below is a list of providers from our database with a direct link to respective providers’ websites, listed in price order (with around 50GB-60GB of monthly data compared). These are featured products. Compared to other providers, Virgin Mobile offered a fairly simple approach to its mobile broadband plans, utilising the Optus 4G network. Plans are split up into 12-month and month-to-month categories, with the former able to be bundled with a pocket Wi-Fi modem or dongle. Month-to-month plans are BYO-device. Plans started at $15/month for 3GB data over 12 months, with big data bonuses on offer to consumers who signed up before Virgin stopped offering plans. Virgin Mobile was rated five-stars overall and five stars in every category – including key ones such as customer service and value for money. Vodafone has a large range of mobile broadband plans – some have mobile dongles or pocket Wi-Fi modems included. Its SIM-only plans start at $15, which seems to be the going rate. Users have the choice of a month-to-month or 12-month contract that bundles in a device. Plans start at $15 a month for 3GB data, while at the upper end users can get up to 30GB data with big data bonuses from time to time. With these plans, Vodafone includes all the usual perks such as $5 roaming, large amounts of bonus data, discounts and more. Vodafone was rated four stars overall, and notably achieved five stars for customer service. Amaysim is another Optus network reseller and has five dead-simple mobile broadband plans to choose from, with the choice of either a prepaid or postpaid plan. Plans start at $15 for 2GB data, and all are SIM-only by default. Data is counted by the kilobyte and expiry periods last for 28 days, not a month. At the upper end of the scale, Amaysim offers 150GB data for $90 a month, which is one of the more competitive deals out there. Amaysim was rated four-stars overall and in most categories, except in customer service, network performance and bill clarity where it achieved three-stars. Out of the providers in this list, it’s perhaps unsurprising to discover that Telstra has probably the most comprehensive array of plans. Customers can opt for a SIM-only, device-bundled or tablet-bundled plan. Users have the ability to choose between postpaid or prepaid plans, with prepaid often featuring bonus data. Telstra plans also feature plenty of perks, including streaming goodies and other bonuses. Telstra was rated three stars overall yet achieve four stars in some important areas such as network performance, bill clarity and ease of activation. Optus reseller OVO Mobile offers four prepaid OVO Boom mobile broadband plans to customers, featuring plenty of data and great unlimited extras. Plans start at $49.95 for 50GB of data, and each option features a 30-day expiry. All OVO Boom plans are BYO modem, although you can purchase one from OVO at sign-up. All plans are contract-free and month-to-month, and include unlimited ‘OVO Time’: access to data-free live sports and radio streaming through the OVO Play app. If you’re looking at data on the higher end of the scale, the XXL OVO Boom plan includes 250GB and is currently reduced to just $99.95 per recharge (down from $119.95). Yet another reseller offering mobile broadband on the Optus 4G Plus network, Yomojo’s plans are available at 3GB, 15GB, 50GB or 70GB tiers, with prices beginning at $15.90. All plans are contract-free and offered on a 30-day basis. You’ll need to bring your own device, and plans will automatically renew every 30 days. Excess data is available to add at a rate of $11 per gigabyte. Exetel offers a wide range of mobile broadband products, on both month-to-month and 12-month plans. Customers willing to sign up for a full year will receive better plan value, with the entry-level $19.99 option including 5GB of data each month contract-free, and 8GB on a 12-month plan. Price tiers go up to the $79.99 plan, which includes either 70GB per month (on a no lock-in plan), or 90GB per month (on a one-year deal). All plans are powered by Optus’ 4G Plus and 3G networks, and customers can either buy a compatible USB modem from Exetel, or bring their own. Moose Mobile currently offers six data-only mobile broadband plans, which are ideal for use with tablets or laptops. Plans range from a low $12 per month (for 1.5GB of data), up to 70GB for $78. There’s lots of lower-data options available, so Moose is good choice for customers looking for on-the-go tablet or device data, rather than a home broadband solution. Like other smaller providers on this list, Moose Mobile runs on Optus’ 4G Plus and 3G networks, and all plans are month-to-month and contract-free. Optus has a comprehensive array of mobile broadband plans, with the ability to bundle in a dongle or pocket Wi-Fi modem. Its SIM-only deals come on either a month-to-month or 12-month contract, with significant incentives to sign on for longer. Plans start at $15 for 3GB on a 12-month basis. Customers also get access to data-free music streaming and included Optus Sport on many plans. On the rare occasions where Optus foregoes its big data inclusions, it more than makes up for it with extra stuff, that’s nice to have. Optus was rated four-stars overall and for most other categories. Dodo has been around for quite some time now, primarily plying its wares in the fixed line broadband sector. But ‘the internet that flies’ also provides a suite of mobile broadband plans. Dodo is yet another provider that offers mobile broadband with devices bundled in, as well as SIM only plans. Dodo’s offerings are comprehensive yet generally priced a little higher than the competition. Dodo was rated three stars for overall satisfaction in our review and for every other category, except for network performed where it achieved just two stars. If you’re after unlimited data mobile broadband – and let’s face it, who isn’t – then there is a burgeoning market for it. It’s called ‘home wireless’ and can theoretically replace your home internet. In most cases, you setup your 4G modem and use it like normal internet – no wires, no installation and setup can take less than five minutes. To get unlimited data, you usually need to spend around $90 a month, and speeds may be rated to 12Mbps to deal with network prioritisation. Smaller service providers tend to operate with lower overheads and can therefore deliver more data often at a cheaper price. However, in terms of ‘extra stuff’, such as data-free streaming, they may lack behind. It’s important to consult Critical Information Summaries here to see what you’re getting. 4G theoretical speeds can exceed 100Mbps, which is fast enough to stream TV shows and sports. However, in real-world scenarios, mobile broadband speeds typically only reach around 30Mbps to 50Mbps, and even slower in congested areas or times. 5G testing has revealed that the new network can exceed 20Gbps in ideal conditions, with more realistic real-world scenarios likely to achieve about 1-5Gbps. This is much faster than anything we have seen in Australia. 4G is still reasonably quick for internet on the go, but 5G will be a game-changer. There are some factors that can affect your mobile broadband speeds, however. What affects mobile broadband speed? Congestion: In busy areas, mobile cell towers are often overloaded with traffic. Ever noticed at a busy sports stadium your data speeds are shockingly slow? That’s the congestion effect. Signal strength: 4G is traditionally strongest in major metro areas, while some areas will only get a weak 4G signal. 3G, on the other hand, is more widely available, but is much slower. Your device’s capability: Most devices are 4G-compatable now, but if it’s more than a few years old, you’re probably still only getting 3G-equivalent speeds as your device does not support the bands needed for 4G. The weather: Yes, even the weather can indirectly affect mobile internet speeds. While windy and stormy weather can physically knock over mobile towers, adverse weather also encourages people to stay home, snuggle up and use the internet, and thus increase congestion. How much does mobile broadband cost? 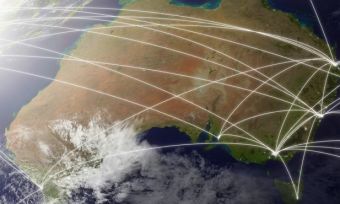 Australians are spending an average of just over $77 per month on mobile broadband, which is a fairly large amount considering average spending on fixed-line internet connections is between $70 and $90 per month, our research shows. You can pick up a SIM-only mobile broadband plan for as little as $10, but expect data allowance to be pretty modest. If it’s big-data you desire, prices rise to more than $80, for which you’ll get around 70-100GBs. No matter what type of broadband plan you need, it’s important to do your research to find a data limit that’s appropriate and at a price you’re happy to pay. Although they may not necessarily make or break a plan, consider other bonuses such as data-free streaming and other perks. Happy browsing! Canstar Blue surveyed 6,000 Australian adults across a range of categories to measure and track customer satisfaction, via ISO 26362 accredited research panels managed by Qualtrics. The outcomes reported are the results from customers within the survey group who have a mobile broadband plan in their name and they pay the bills – in this case, 1,063 people. 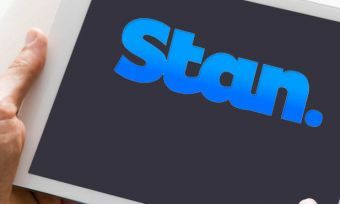 Compare internet deals from providers such as Belong, SpinTel, Amaysim, MyRepublic, AusBBS, MATE, Barefoot and Telstra with Canstar Blue. 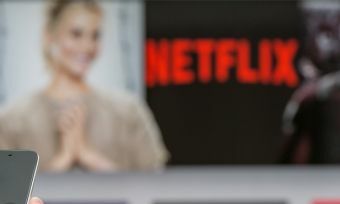 Netflix & Foxtel are two of the biggest players in the entertainment subscription market, but they are very different. Which one is right for you?